Although Bostwick’s stable currently stands as a single structure, it wasn’t always so (Fig. 1). Shortly after the construction of the main house in 1746, work began on several outbuildings. Built as the home for a wealthy merchant, Bostwick was a hub of activity in the newly formed town of Bladensburg. The two different types of foundations under the stable suggest multiple building events; a layered stone foundation supports the West side of the stable and a stone pier foundation supports the East side (Fig. 2). If it was built as one unit, the foundation would be uniform across the whole structure. Thus, these exposed foundations allow us to “read” that the building evolved from one then two outbuildings, and then those were connected. (Fig. 3). ​ The two different foundation types tell us that originally, there were two separate structures. Further evidence is found inside, as two different frame types are evident. Figure 4 shows a post that has hewing marks. In the eighteenth century, hand hewing was a primary method of squaring round logs for use as posts (Fig. 5). Although posts could be further refined, the rough surface left from hewing is appropriate for use in an outbuilding. A mortise in one post near the ceiling on the first floor and a tenon at the top of one of the posts further suggests an eighteenth-century date for this building (Fig. 6). The East end of the stable has a frame of sawn members, rather than hewn. This indicates a slightly later construction date than the section on the West. Outside, the lack of foundation between the continuous, non-coursed stone foundation and the stone piers corroborates the idea that these were separate buildings. The two sections were connected by a center aisle, made from sawn, dimensional lumber indicating an even later date. According to the documentary history of Bostwick prepared by John Milner Associates for the Town of Bladensburg in 2007, “at the end of the eighteenth century, the Bostwick property contained the house, a separate kitchen, a carriage house, a wash house, a hen house, a meat house and a milk house (both constructed of brick), and a store room.” These two separate outbuildings may have been among those listed above, as their framing and foundations are constant with eighteenth- to early nineteenth-century construction. As time went on and need arose for a larger structure, the two buildings were connected (See Fig 7 and 6).The milled dimensional lumber connection is late nineteenth to early twentieth-century and indicates that the two outbuildings were connected at this time. At the same time, a new gambrel roof was built connecting the buildings into a single structure. This was likely added by James Kyner after he bought Bostwick in 1904. He was responsible for adding the large porch at the front of the main house and updating the house in the popular Colonial Revival fashion. Missing from this evolutionary picture, however, was any idea of the original roof pitch of the two outbuildings that would later make up the the stable. 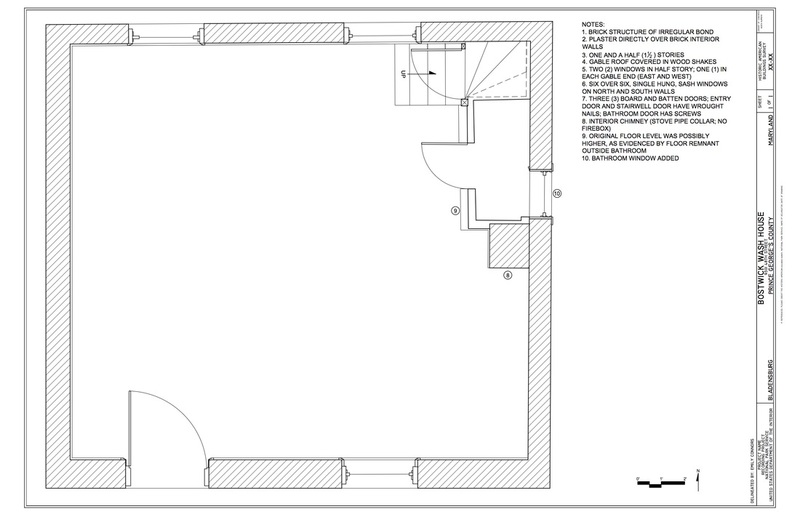 Evidence of the original roof pitch on the eastern of the two original outbuildings was discovered when a group of students noticed a diagonal cut in siding above one of the corner posts (Fig 2, and detail in Fig 3). The tenon on this sawn post shows the eighteenth to nineteenth-century frame work and original joinery of this section of the barn, consistent with the other corner posts of this section (See Fig. 7). The cut in the siding is at about a 45 degree angle, indicating a medium-sloped pitch on the front-gabled structure. Above the angled seam, additional wooden blocks have been added for leveling; in order to raise the height of the new roof, newer elements have been fit into the older frame members to minimize the removal of original fabric. Elsewhere in the construction of Bostwick we have seen evidence of material reuse, and the choice not to strip away unnecessary parts of the second-story wall for the sake of a uniform appearance is testament to reuse and economic application of time and material. Figure 1. First floor plan of the Bostwick wash house delineated by Emily Connors as part of her Measured Drawing course (HISP 679). Note 9 refers to the original floor remnant outside the added bathroom. Figure 2. The small ledges on either side of the door contain a surviving floor joist capped with remnants of late nineteenth- to early twentieth-century flooring in the wash house at Bostwick. Note the door extension. When the wash house on the Bostwick property was converted into an apartment living space in the very late nineteenth or early twentieth century, the floor plan was adapted to include a bathroom and kitchen area on the first floor (Figure 1). Once the builders completed this transformation, they left behind several unintentional clues to the building’s former flooring type and floor level. On either side of the bathroom door are small ledges, actually the remains of a former floor joint covered with tongue and groove flooring; the other clues are the extensions on the bottom of the doors to the bathroom and main entrance (Figure 2). It appears that when the understair closet was being converted into a bathroom, the flooring and joists were removed in order to install the drain pipes for the toilet and sink. With the installation of the new lines complete, the builders poured a concrete floor and covered it with tile. Because the closet was already enclosed and the wall connected into the flooring system, the workers simply cut the floor several inches from the closet wall, leaving behind the supporting floor joist and flooring; this extended the wall to the new lower floor level (see Figure 2). These remnants were then encased with baseboard trim to finish them off. The same issue arose with the winder stair to the attic. An extra step was added at the bottom to lengthen the stair and it is the same height as the ledge outside the bathroom (Figure 3); this bottom step is about half the height as the other steps. The floorboard remnants are tongue and groove with blind nails (Figure 4). The narrowness of the floorboards in the wash house suggest a post 1885 date. In her history of the wood flooring industry, Kim Dahlgern notes that the side-matcher was developed in 1885, “creating flooring with a grove on one side and a tongue on the other…the flooring was 7/8 inch thick, 2 1/2 or 3 1/4 inches wide.” The floor boards in the wash house are very similar in size, measuring 1 inch thick and 2 1/2 inches wide, and clearly standardized, milled lumber. More evidence of the change in floor height is found on the main entrance door to the wash house door. Like the bathroom door, the bottom of the main door was also lengthened to accommodate the new lower concrete floor. (Figure 5). Figure 1. This photo shows the underside of the first-story floor beneath Bostwick’s “large room.” The original doweled flooring has been reused and attached to the pit sawn floor joists to level the early 20th century floor replacement. Figure 2. Detail of original floor board with dowels. When the flooring in the “large room” was replaced in the early 20th century with standard 2 ½ inch tongue and groove oak, 1 inch boards were sistered to the pit sawn floor joists to provide a level nailing surface for the new floor (Figure 1).During class, Dr. Linebaugh discovered that these sistered leveling boards are actually original 18th-century floorboards salvaged from the old floor when the new floor was installed. This assessment is based on the protruding dowels visible in certain places on the boards, a feature newly observed (Figures 2-3). As explained in The Chesapeake House, dowel and secret-nail flooring represented the best flooring available in the second quarter of the 18th century when Bostwick House was built (Figure 4). “The Builder’s Price Book listed the cost of the ‘best doweled floors at $8.50 per square, five-and-a-half times more expensive than the widest, face-nailed, ‘square’ joint (butted) flooring.”1 The narrowness of the floorboards also indicate expense, and buyers paid a premium for floorboards between 3 and 5 inches. The repurposed 18th-century floor boards at Bostwick are between 5.5 and 5.7 inches wide, though this is just out of the most expensive range the type of flooring still indicates quality.